Our Customisation Team are often tasked with creating unique, made to order envelopes and packaging solutions in various shapes and sizes, including customised envelopes used for imaginative mailings or overprinted cardboard boxes and personalised metallic gloss bubble envelopes. However on many occasions our team are commissioned to create envelopes used for anything but mailings. Some recent examples of the bespoke products that our specialist team have created solutions for include: a dental repair kit, a drinks set and an envelope used for securing fashion pattern pieces. Anything really does go. But one of our recent projects included an envelope that would be used to hold the most unique of contents. Back in the summer of 2017 we were approached by premium British company and producers of the finest furniture and accessories, Higgs & Crick. Higgs & Crick offer the highest quality items and pride themselves on the values: “Everything we conceive and produce should have the most ambitious aesthetic quality as well as an original and stimulating story behind its conception”. A value that resonates with Blake, this was embodied more than ever in the release of one of their finest drinks sets. 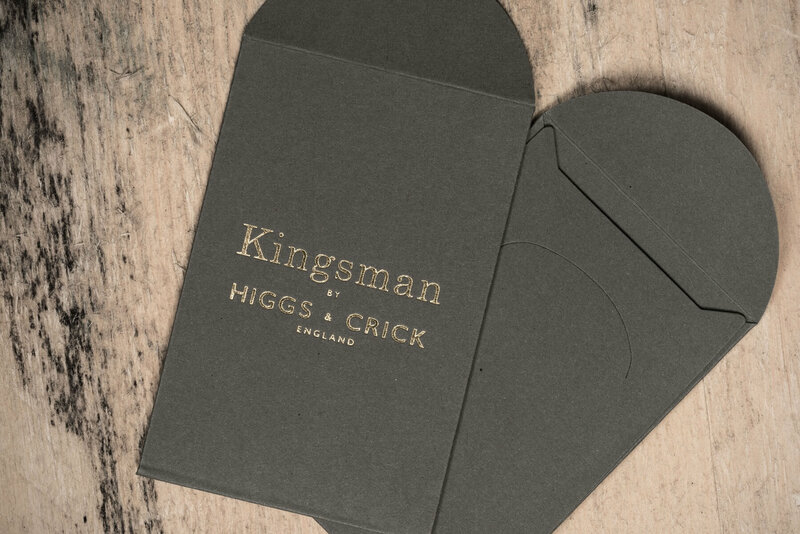 Approaching Blake’s Customisation Team, Higgs & Crick wanted to create a small bespoke envelope with foil print to go with their handmade Kingsman Three-Piece Decanter Set, costing £2,950. The envelope was 90mm x 60mm and would hold a small set of keys, which would be used to open a padlock to the solid walnut and maple box that houses the high quality handmade glassware. Only a small detail to the overall product, however creating this envelope to the highest standard added an extra touch of finesse that could have been easily overlooked. Choosing premium materials, a slick fastening method and featuring the brand’s logo in foil print all contributed to the overall quality of the product and helped to delicately elevate the branding. Our Customisation Team work with the client to ensure the best materials and techniques are utilised; ensuring a high quality aesthetic to allow the ultimate in brand promotion. The team follow up each design sent, with a handmade, mock up sample. Plus, a selection of different paper options are supplied, giving the customer a range of choices for their bespoke piece. Throughout the entire process regular and open communication is carried out in regards to the progress and production of the final product. By working collaboratively and openly with the client our team ensure that they are able to create a product, within the timeframe, that is always on brief, often going above and beyond to deliver a product that guarantees a happy customer. Working with brands such as Higgs & Crick, who too are focused on producing high quality offerings ensures our working practices are aligned. With our focus on creating the highest quality product, no matter what the use, however big or small, we can design each bespoke envelope or packaging solution to hold whatever contents you require to ensure a lasting impression is always delivered. To learn more about our Personalisation Service take a look here. And if you can’t see what you are looking for our Customisation Team will be able to help you create whatever vision you have.